You never know what will be happening when you visit a waterfall. 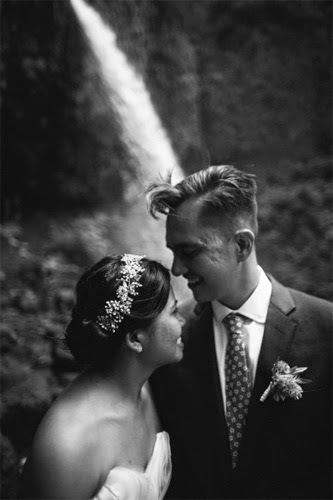 This couple held a spontaneous DIY wedding at Wahkeena Falls, and it was beautiful. Waterfalls along the Columbia River Gorge are amazing locations for any wedding. The scenery of waterfalls, trees and all the natural beauty they are great ways to save money on the venue and decorations. Read some details from the bride herself about her arrival to Wahkeena Falls for the first time for her wedding below. When we got to the parking lot of Wahkeena Falls, that was the first time we had all been there. It was the first time we met our photographer, Carl Zoch. I walked down the aisle of white roses with my dad to the processional song of the acoustic version of Lover’s Carvings by Bibio, which Freddie’s talented musician cousin played with guitar. You could hear the sound of the waterfall. It was magical. All I could feel in that moment was complete calm and happiness. There I was walking down the aisle with my closest family and friends watching (with no seating…they were all such good sports and were all standing since this ceremony was more elopement style. It wasn’t a place we booked, we just went there for the first time and got married there). Our wedding officiant was, Matt. He is a best friend to both of us. Freddie has known him since middle school and I’ve known him since high school. It felt really special to have someone who truly knows us well and our relationship to marry us. Everything he said was personable and funny, exactly what we wanted ☺ We exchanged our own vows that we wrote ourselves along with our Tacori rings. The ceremony was probably no longer than 15 minutes.